After the NBA official Sina Weibo account posted a 30-second video of NBA stars sending out Chinese New Year greetings on Friday, it quickly went viral, garnering 108 million views and 18,000 reposts. 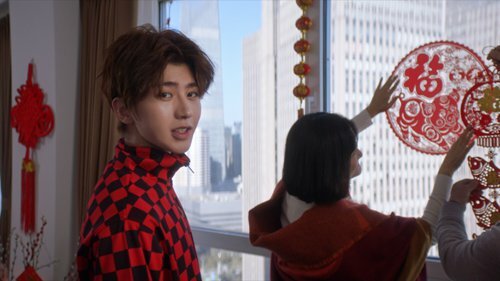 However, these high numbers were not solely because NBA stars including Klay Thompson, Damian Lillard and Giannis Antetokounmpo made appearance, there was another factor - Chinese singer Cai Xukun also walked into the video. Cai, one of the most popular idols in China, has more than 20 million followers on Chinese social media platform Sina Weibo. In the video, Cai makes his first official appearance as the NBA's Chinese New Year Celebration Ambassador. While the NBA was most likely counting on Cai's popularity to help promote basketball among a larger Chinese audience, his appearance has actually caused some controversy as many sports fans in China have reacted negatively to the decision to bring in the singer. This hostility has been especially obvious on Hupu, a Chinese sports platform that is home to the biggest Chinese NBA community. Hupu is often regarded as a "straight man" platform and so is home to many users who are seemingly unfriendly toward male idols that they see as being too "feminine." According to a poll of 41,000 thousand "JRs," a nickname for Hupu users, 10.3 percent said the decision to have Cai act as an ambassador was cool, 9.7 percent said it was a bad decision and an overwhelming 80 percent said it was "trash." "It's disgusting and ridiculous. I would rather not watch the game if it is going to shove an image of Cai at me during half-time," netizen pgfox commented on the survey. "How can he represent the NBA, he plays really poorly," netizen Tusker posted. The situation was totally different in the comment section of the Chinese New Year video as most posts were from Cai's fans. "We wish you guys a happy Chinese New Year. Cai really loves basketball, we are happy to accept the NBA's invitation!" Sina Weibo user Powerful-Kun posted. In China, Cai's fan groups are famous, or perhaps infamous, for their ability to come together to promote the singer through activities such as mass posting to comment threads, spinning negative news and arguing with anyone who dares insult their beloved idol. It certainly seems there is a very large split between Hupu users and Cai's followers. Adding fuel to the fire was a highly inflammatory article titled "Hiring Cai as an image ambassador: The NBA should apologize to Kobe and Yao Ming" published to WeChat blog Xiaosheng Bibi on Saturday. Throughout the article, which already has more than 100,000 views, the author referred to Cai as an "image ambassador," which can be misleading as it indicates the singer is representing the NBA as a whole instead of just for the Chinese New Year holiday. This has lead many netizens to think that Cai has become a spokesman for the NBA. "Cai isn't endorsing any products for NBA China, he is only a Chinese New Year Celebration ambassador, which is his role in the video, not the ambassador of the game of basketball," said Jiao Huayi, a journalist covering basketball for Titan Sports, a major Chinese sports media outlet. For this reason, Jiao said it is better to see the video as a part of the NBA's annual Chinese New Year celebration promotions instead of the inauguration of an image ambassador. According to NBA China, for two weeks before and after the Chinese New Year, many stadiums will sport traditional Chinese decorations, while 15 NBA teams will host activities at these locations to celebrate the holiday. Some US teams, such as the Houston Rockets and Golden State Warriors, have put on Chinese-style jerseys during matches. According to NBA China, their aim is simple: have NBA teams celebrate Chinese New Year together with Chinese people and Chinese stars. With this in mind, the NBA reaching out to Cai should not entail special connotations. In fact, the combination of sports and entertainment is not novel at all and is not limited to basketball. Movie stars or cultural celebrities like Jackie Chan has kicked off a basketball game. Major entertainers like Bruno Mars has performed during the Super Bowl halftime show. Actress Nicole Kidman even appeared at the Ferrari garage at the Australian Grand Prix in 2017 to ask racer Kimi Raikkonen for a photo. It's clear that sports needs to cooperate with the culture and entertainment industries in order to expand its boundaries and potential fan base. "The main product of the NBA is the game itself and the core is fans," Jiao told the Global Times. "NBA China's cooperation with Cai will attract more girls to watch and love NBA." Before Cai, the NBA had already cooperated with popular Chinese stars such as Chinese-Canadian singer Kris Wu, who has joined the NBA All-Star Celebrity Game for three years in a row now. Li Yifeng, a Chinese actor, was invited to watch the career finale of his basketball hero Kobe Bryant in 2016. These collaborations are usually based around single events. In fact, it is rare to see any long-term or commonplace cooperation between the NBA and Chinese stars. However, as the boundaries between industries continue to blur, young fans from both sides need to learn how to understand and communicate with each other.